Summer was at it’s peak in Kathmandu and there was no clue of monsoon. We were all tired by summer heat, so it was a great opportunity for some water sports. Rafting was on the minds of most of the people here in Deerwalk including me. A trip was planned earlier but was canceled due to project deadlines. So, I planned to organize a rafting trip for the next weekend. Accordingly, we fixed 5th June, 2010 for the trip. 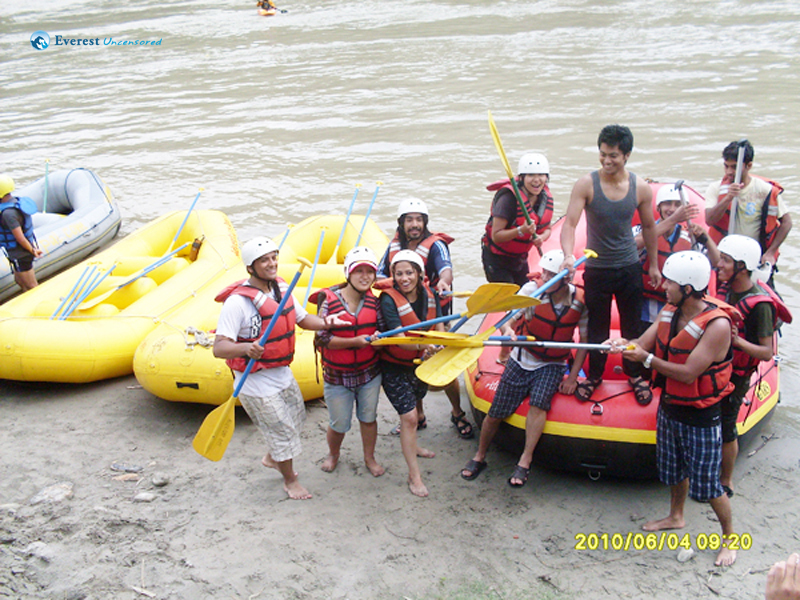 The office atmosphere suddenly changed after knowing about the rafting plan and a sense of excitement aroused among all of us. All together, twelve people were ready to go. 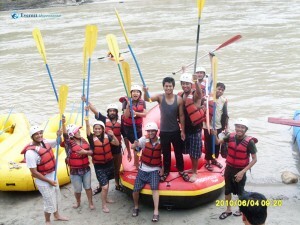 The team consisted of Anjan, Lakesh, Aabhushan, Krishna, Rajendra, Nimesh, Janni, Sushma, Arati, Pritesh, Sagar and me, Sumit. As planned, we all arrived well prepared at our office premises before 6 in the morning. 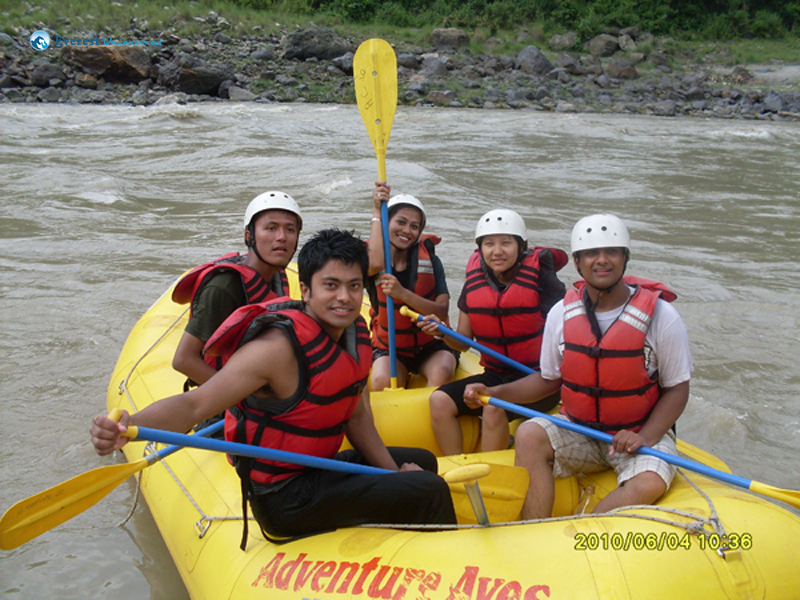 As an organizer, I had extra fear in my mind regarding several things other than rafting itself as I was organizing such trip for the first time. 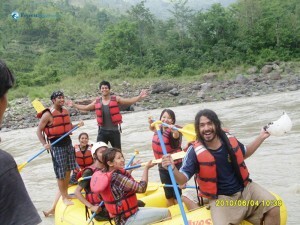 We boarded the reserved bus and reached Charaundi, the starting place for rafting, at about 12 pm. The day was very hot but river water was cold. Pritesh, Nimesh and Anjan had a quick Kayaking round at Trishuli banks while others joined them shortly. After a delayed breakfast, we were given a security briefing by Lok, our rafting guide. We took two small boats with 6 persons on each of them. 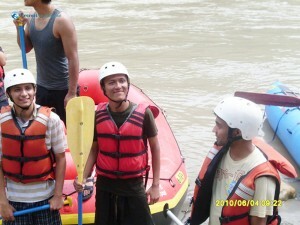 We put on life jackets and safety helmets which gave us a different and funny look. Aboard the boat, we were given introduction to the rafting practices and commands like “all forward”, “all backward”, “right back”, “left back”, “all down”, “over right”, “over left” etc. Aboard the boat, we were given introduction to the rafting practices and commands like “all forward”, “all backward”, “right back”, “left back”, “all down”, “over right”, “over left” etc. 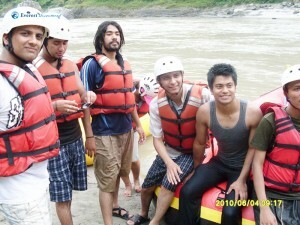 After practicing those commands for some time, our rafting journey finally started. Kayak rescuers accompanied us, making us feel secure. The summer heat, that we were experiencing before, disappeared suddenly along with our tiredness. Our guide mentioned some named and unnamed rapids along the way. The initial rapid was unnamed but it surely thrilled us. Then came a rapid called ‘twin rock’.It was named so because we had to pass between two huge rocks without hitting them. It was extremely exciting when the tides shook the boat and water gushed in. There were high fives all around after we tackled each rapid. On the way, we had water splashing competition with other boats which was fun. Then we approached a rapid called ‘ladies delight’. I don’t know why it was named so but I think it was due to series of thrilling sub-rapids in it. After some minutes, the river water became still and we were allowed to swim. Soon after that we encountered another rapid named ‘Land Slide’ which was more powerful. Large waves of water struck us with force, moving us and our boat haphazardly. The water level had grown with regular rainfalls in the hill sides, so rapids were more dangerous. After each rapid, we used to ask the guide if it was the most dangerous one but he used to say that dangerous one was yet to come. It felt great to bend outwards from the boat and float on water, looking high towards the sky and cliffs. Then we rested for some time on the shores and clicked some pictures. After the break, we were given instruction to be very careful and have foot on locks firmly, as rapids were more powerful thereafter. We exchanged Sushma and Rajendra between our boats. Small rapids felt uninteresting now and we ourselves expected some powerful ones ahead. ‘Monsoon’ was the next rapid and it was as powerful as we were told. Our boat was first to start the ‘offset’ challenge that required us to tackle two rapids. The first one was indeed very wild one which passed brushing by some cliffs. There was no need to paddle as the waves itself pushed our boat. At one instance, the waves pushed the boat turning it vertical by almost 90 degrees. I can still feel the force of those waves. The second ‘offset’ was nothing compared to the first one and we passed it with ease. The boat became uncontrollable and our guide commanded us to get down. Our boat completely immersed in water with large waves hitting us hard. This went on till our boat banged hard with a cliff and then bounced back away from the cliff. I feared if our boat was punctured but luckily it wasn’t. As we were holding the rope tightly, we didn’t fall off from the boat. I could see our other boat having the same problem and also other large boats following us. The name ‘offset’ was indeed appropriate for the rapid. The second ‘offset’ was nothing compared to the first one and we passed it with ease. Finally, we approached our destination, a place called Phisling. Before leaving the raft, we played some rope game during which we got unbalanced and fell down. After we got down from the boat, we had a photo shoot. The time was about 4:30 pm and we had the food that was waiting for us there. We had completed 16 km of rafting and had lots of fun along the way. The journey back to Kathmandu was filled with talks about the fun and adventure we had during the day. The clock was showing 10 PM when we reached Kathmandu. We said our goodbyes and made our way home. Rafting was really a different experience than we thought it would be. It’s a risky business but the adventure that comes with it makes the risk worthwhile. 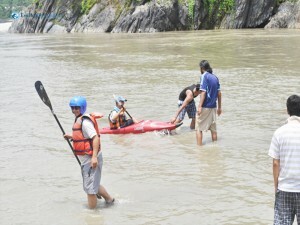 Rain water had increased the water level of the river which made it even riskier but also made it more thrilling. 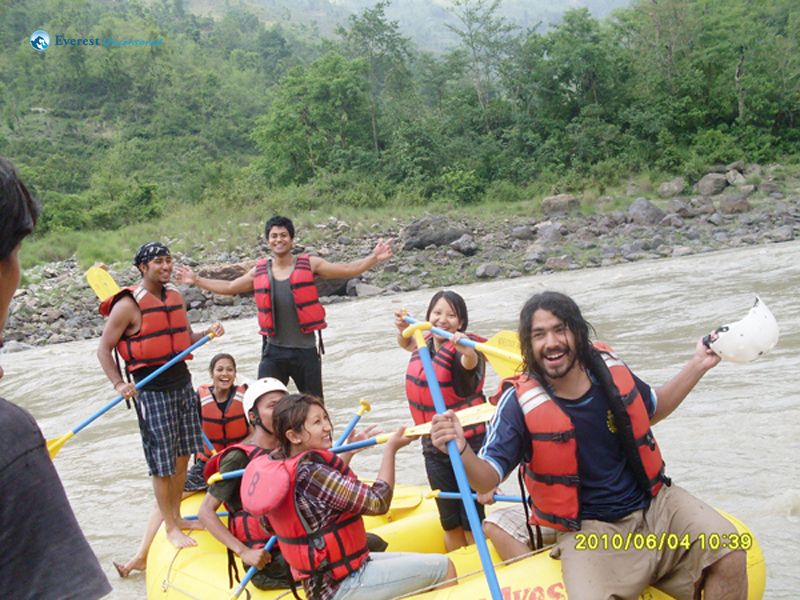 The idea of having fun and adventure regularly is to help us maintain our enthusiasm and productivity. And it is what I’ve always admired at Deerwalk. And after this trip, I am sure that it has done it’s trick, again.